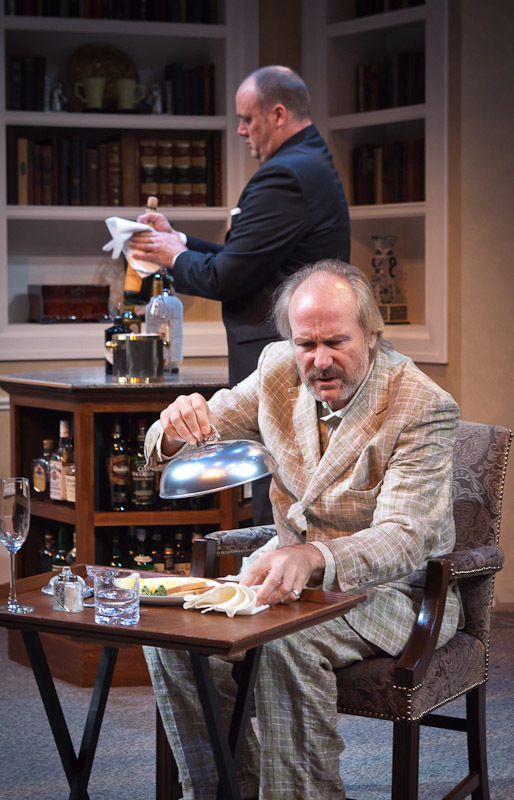 A few days ago my friend Barry Johnson, the guy behind the infant but swiftly growing online magazine Oregon Arts Watch, asked me to sit down with him and talk about Harold Pinter’s No Man’s Land and actor William Hurt’s starring performance in it at Artists Repertory Theatre. I said sure, and Barry brought his high-tech equipment over to Art Scatter World Headquarters, where we locked ourselves into the executive clubhouse for a half-hour and chewed the theatrical fat. The result, a 17-minute radio-style conversation, is now posted at Oregon Arts Watch. It nicely complements my own thoughts on the show in this post, and Barry’s here. If you’d like to hear the voices behind the bylines … well, there we are. Harold Pinter had one of those deep, dark provocative minds, the scary kind, and he used it to create characters that resembled almost exactly the furtive and often malign creatures that burrow around inside our heads and heart, alternately bullying us and cringing in the corner. I’m thinking of early Pinter here, the Pinter of The Caretaker, The Homecoming and The Birthday Party, plays written between 1957 and 1964 that Portland theaters still occasionally produce. 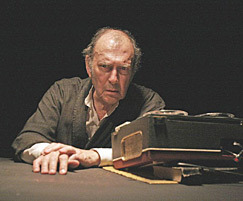 Which makes sense, because there’s really nothing quite like them, the plays that gave us the “Pinter silence” — the tear in the fabric, the hole in the dike. Except for Betrayal, I don’t know the rest of his work nearly as well, and I only know Betrayal because of the excellent film version, adapted by Pinter and starring Jeremy Irons, Ben Kingsley and Patricia Hodge. It has a wistful tone, maybe it’s the score, that takes some of the sting out. Back to Pinter, who died on December 24, having fought cancer since 2001. As his playwriting career began to wind down, he became more and more political, and his Nobel acceptance speech in 2005 excoriates the role America has played in the world, that record of supporting dictators and expanding our economic interests, and the consistent support Britain provided for our “adventures”, including Iraq. We leave you with that 46 minute speech, or rather with a link. It circulated widely after he delivered it — by turns angry and bitter, the notes of a man betrayed. But if you didn’t hear it then, maybe it’s a fitting way to see him off today.